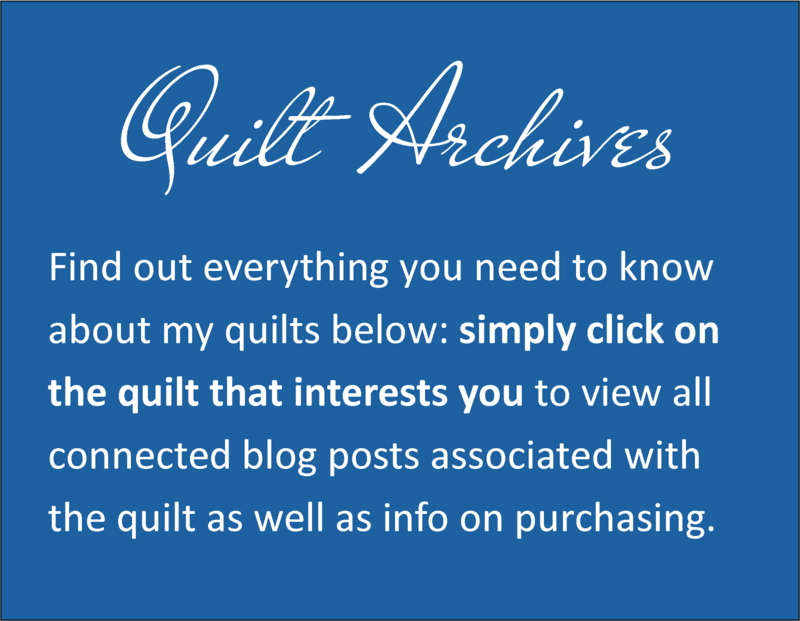 My Quilting Must Haves List! Block of the Month 2019: Hold Onto Your Heart! 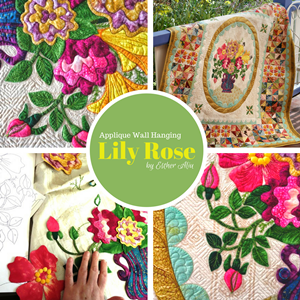 As you read this, I'm heading off to WA for a series of classes and I'm leaving Lily Rose behind on my design table with mixed feelings. The stain is out and I'm relieved about that, but as Sally mentioned in the comments yesterday - I'm going to have to make sure that no trace of the chemical remains in the fibres where it might damage them in the long term. What can I say, I should have taken my own advice and that was certainly a reminder to me. Testing for colour fastness is always a must. Why didn't I listen?! Speaking of Lily Rose, yesterday I unpacked my batting in preparation for quilting when I return home next week. Do you have a pesky pet hate? I do. This is an especially pesky annoyance of mine and it happens much too frequently in my opinion. When I unroll a new bolt of batting and it has an ingrained buckle in the weave. Can you see what I mean? This isn't a crease, it's an actual fault through the batting loft, its like an overlap - it's rough, higher than the rest of the batting and generally super annoying! This is Hobbs Premium Cotton Batting and its what I'm using for Lily Rose. There are always degrees when you find this kind of fault, usually they are very minor and can be simply ignored, but this one is lumpy and hard. I have found that batting with this kind of fault never quilts or hangs nicely, there are always issues. I really wish Hobbs had better quality control, I really don't like having to fix things before I use them. I'll have to cut out this fault and lose quite a bit of batting doing so. And I just don't think I should have to. It's really annoying. I am just so mad with myself! 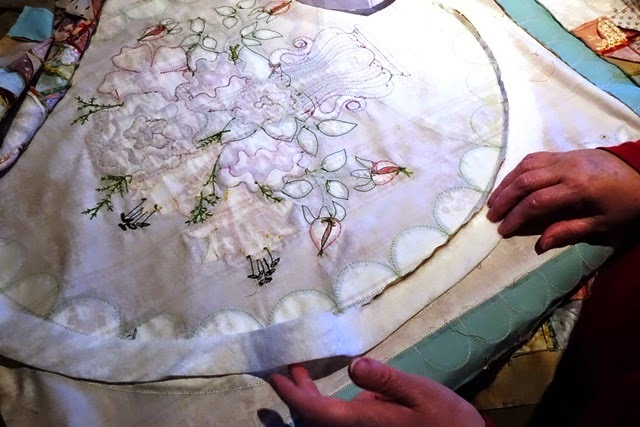 You'll know that I always recommend pre-colour testing all your fabrics and especially batiks. But did I actually go ahead and do that? No I didn't! I did a quick spot test with some water (not following my own method) and thought that would be fine. 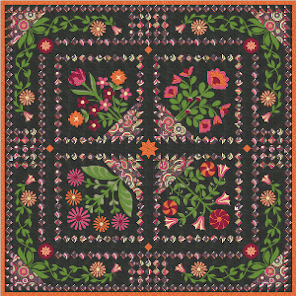 I took this image with a big sigh of relief, thinking I'd accomplished so much making this quilt in so little time. Here it is being washed in preparation for those final finishing steps. 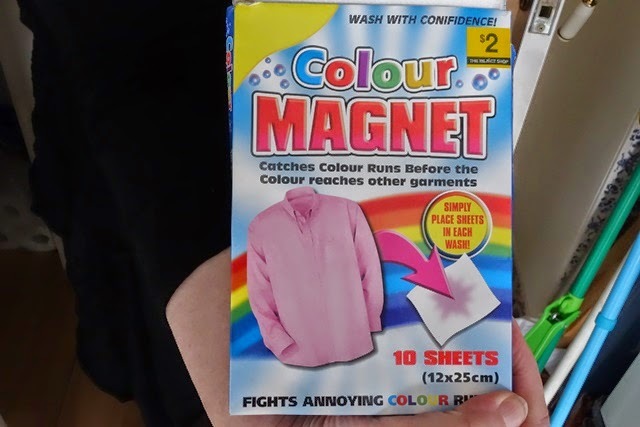 I'd even purchased some Colour Magenet sheets to use 'just in case' as a back up. But straight out of the machine, and all is not well. I notice some magenta in the water and cold rinse straight away. Then I lay it out flat on my table with some absorbent towels beneath. The dye has run right in the focus of the light background. It can't be covered up and as the background is beige and printed, it can't be bleached out either. And the right side of the centre background has turned a pale lilac hue. My heart just sinks. So much work potentially ruined with such a basic mistake. I can't live with this kind of smear on my quilt. Especially as its a wall hanging. I know this dye run will drive me crazy in the long term. My only option is to get it out. 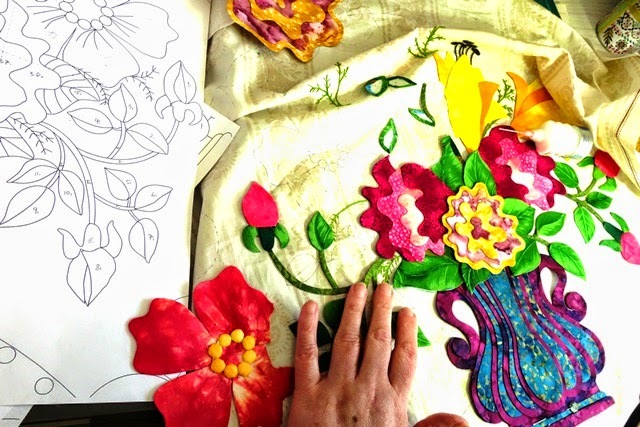 I even consider unpicking the bouquet, but I've stitched it down by hand really thoroughly and it will be next to impossible to do. And it will mean losing all my embroidery embellishments too. I would normally never recommend using something I've never used before as a fix, but I really have no option and have to act quickly. I drive down to the shops to pick up some dye remover. The only one I can find is Dylon. Strangely, there are no instructions on the packet as Dylon assumes you will throw it in the wash. 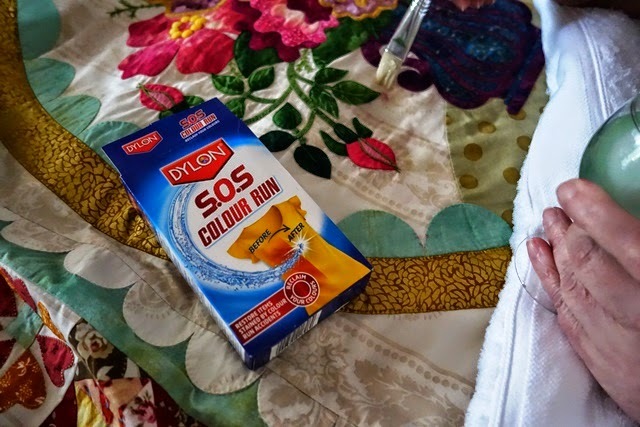 But I'm hesitant to wash my quilt again and worry that Dylon might actually release more colour rather than collect it. After all, its made to clean up garments, not fabric saturated quilts. I decide to mix a tablespoon into a glass with some warm water. Experimenting mid disaster is not a good idea, but the fact is, I can't live with the stain above and really don't have any other options. 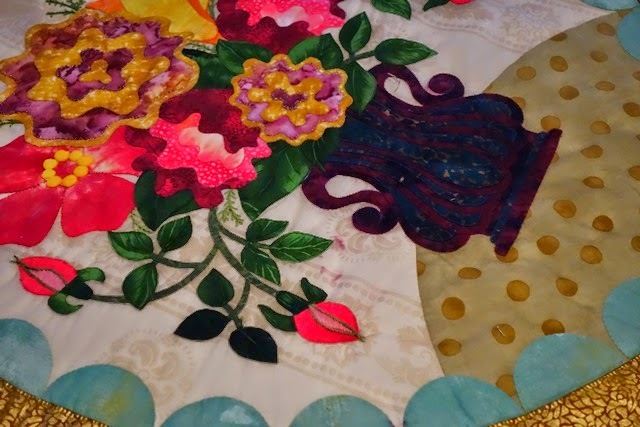 In the car on the way back home I reason that I will unpick and salvage what I can of the applique and remake the rest on a new background (I don't have enough of the current fabric). So it's really a case of trying to save my weeks of work. 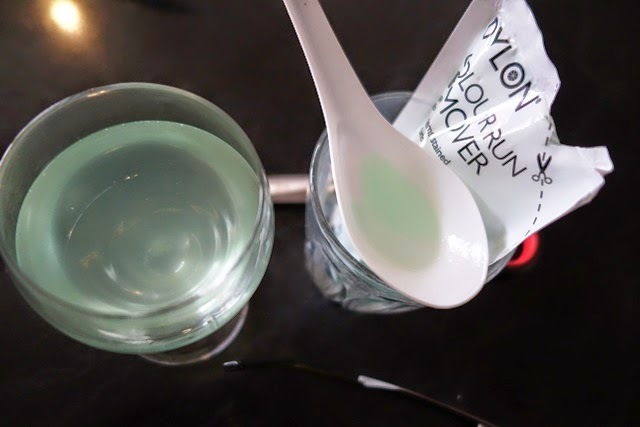 I start 'painting' my stained areas with concentrated Dylon. 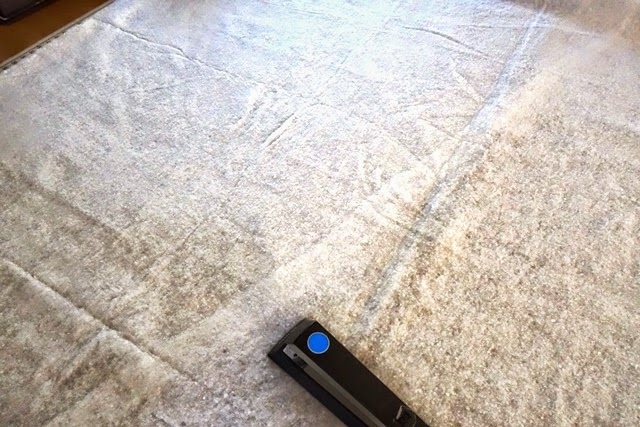 I saturate and immediately blot the area with a clean white, dry cloth. I also have extra dry white cloths beneath the quilt to absorb excess moisture too. I saturate and blot continuously. 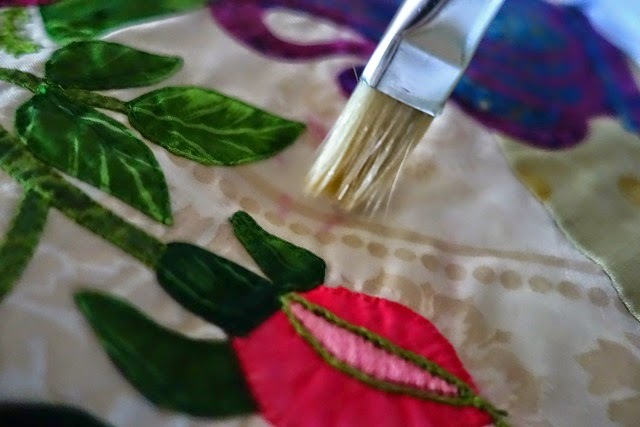 As I start cleaning up, I notice small pools of discoloration all over the background that didn't immediately show up as a stain but will certainly come through as the fabric dries. I saturate and blot these areas too. My batik vase is the cuplprit and you can see from the back that it has run a fair bit. Over on the front, the released dye has created a halo around my handles and I can't get them cleaned up with the paintbrush alone as the Dylon is making the fabric bleed when it comes in contact with it. I'm so glad now I didn't throw it in the wash as per the instructions as it would have bleed much more. I have to unpick my vase edge details and the handles to clean up the stain properly. I will then restitch the handle pieces back down when the stain is removed. It looks like Dylon SOS has saved the day. I love this product, its a new 'must have' in my laundry now.I'd previously never used it before for anything so its been a nice surprise. 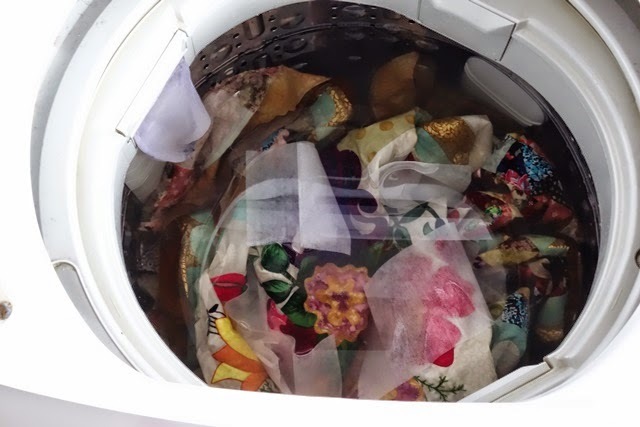 To be honest, most products for the laundry which I have used for stain removal have been total disasters on my own shirt fabrics. I'm just so glad this worked. It's definitely time for me to have a coffee and a lie down. I have a pounding headache from the stress of my own stupidity. I really should listen and take my own advice regarding pre colour testing. Shortcuts are never so. I know that better than anyone. 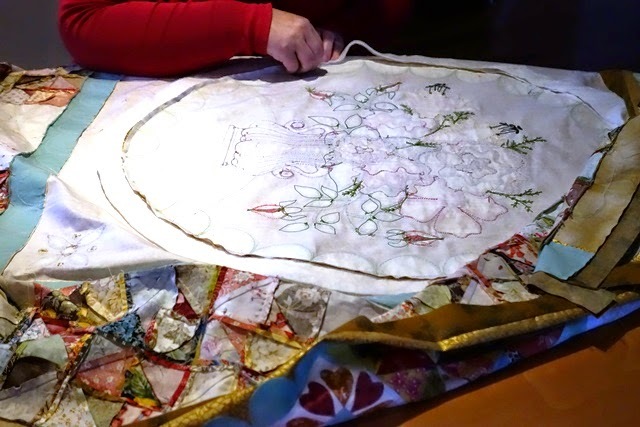 Making a quilt with love for the purpose of giving it away is one of life's pleasures. It's even more special when that quilt is for a baby. Last year a dear friend of mine became Godmother to twins: a boy and a girl. Not being a quilter herself, she asked me if she could borrow some quilting books from my bookshelf. I was more than happy to agree. Being a sewing enthusiast, she was more than capable of sewing the quilt, she just couldn't decide on a pattern. So she asked me to design a pattern for her; one for a boy and one for a girl. She wanted lambs and classic pink for the girl and blue for the boy. It had to be simple and 'babyish' she didn't want anything too modern. Oh, and as she was giving these quilts as a Christening gift, she wanted a William Blake quote on there somewhere as well. 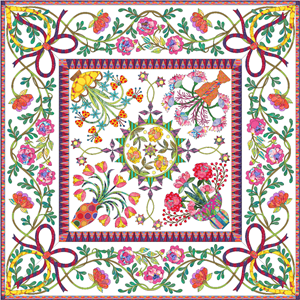 She intended to gift the quilts with a Bible and book of poetry, so that was her design wishlist.Well, I was stumped! 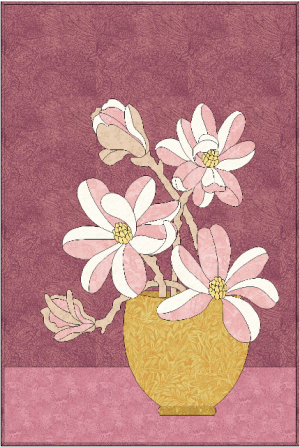 But then I just decided to design a classic baby quilt according to her guidelines. 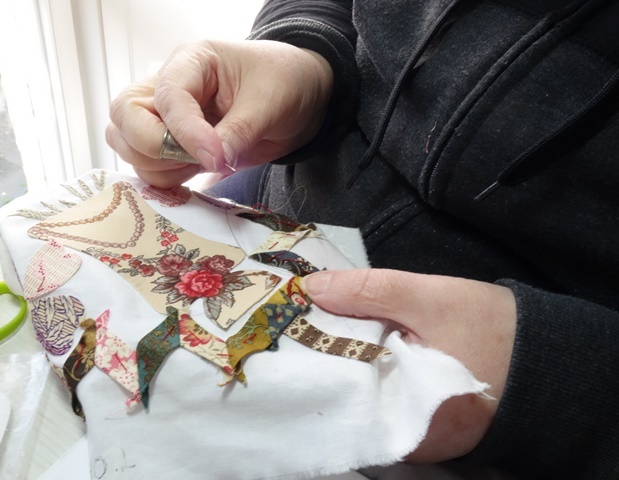 The Christening came and went and, like many quilters, she found her sewing deadline quite tough to stick to around a full time job and family of her own. So now, these quilts will be a 1st Birthday gift instead. 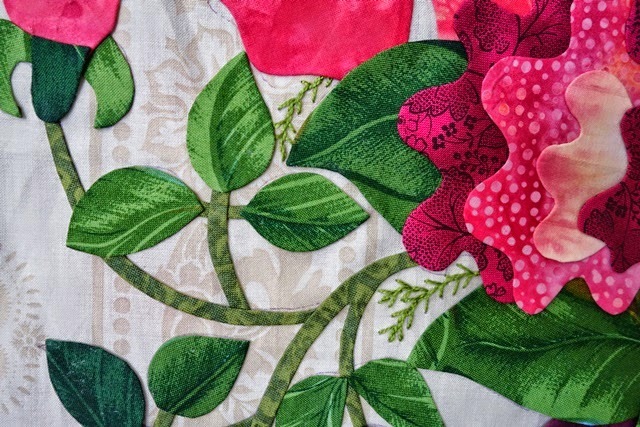 I was in two minds about releasing my baby quilts as I've always been too busy, quilt design wise to set aside time to put it all together in a 'pattern'. But last year after the intensity of Love Entwined, I decided that I would open up my design folio and start sharing whatever was in there. 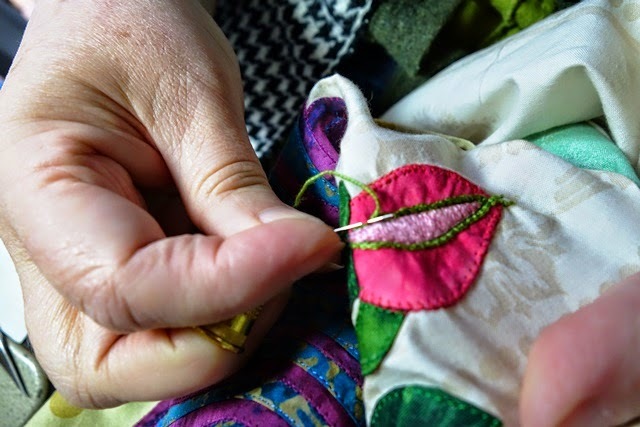 Even the quick, fun quilting projects. I have several baby quilt patterns that I've made over the years and in the weeks ahead, I will be releasing those here too. Little lamb, who made thee? Making all the vales rejoice? Dost thou know who made thee? For He calls Himself a Lamb. He became a little child. We are callèd by His name. Little lamb, God bless thee! Songs of Innocence by William Blake was originally a complete work first printed in 1789. It is a conceptual collection of 19 poems, engraved with artwork. 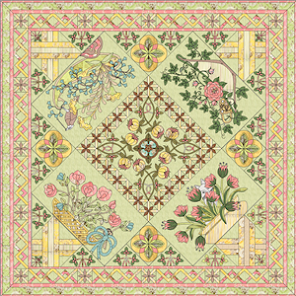 The Lamb is a beautiful poem and ideal subject for a Godchild's quilt and I'm really happy to share this pattern with you. 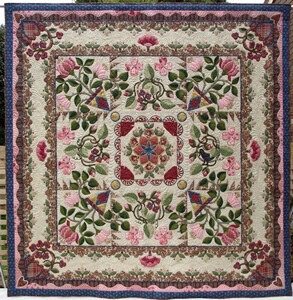 Of course, there is also the option of making this quilt without the applique letters and quoting your own verse, name, date or simply leaving the borders blank. 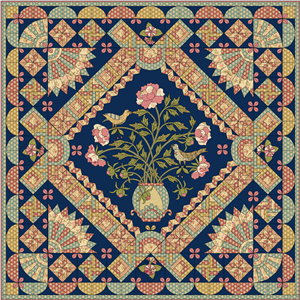 I am releasing this pattern as a 'complete' pattern, not a BOM. It will be available to members of my Yahoo BOM Group for 1 month for free. I will also be releasing the matching cushion to this baby quilt in the weeks ahead. 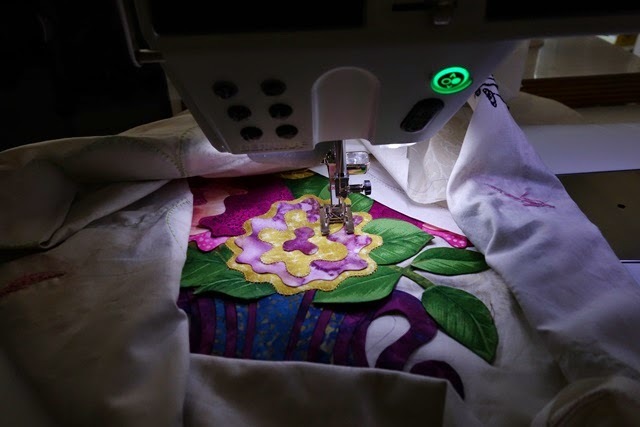 If you do make this quilt, please let me know by leaving a comment over on the Little Lamb page at the top of this blog and if you have a blog, why not add a post link of your own quilt progress on the permanent linky? I've decided to 'puff' out the oval frame with some extra batting. I've cut out my batting accurately around the oval template and am putting it down into position accurately. I just feel that the quilt centre needs this little extra. Sometimes, depending on the thickness of the fabrics, I just don't think that extra batting or stuffing areas with trapunto wool is necessary, but lately I've gotten into doing this all over again. It doesn't make an instant visual difference, but it is a subtle and enhancing detail. the biggest 'difference' will be when I quilt the oval frame; this little bit extra of batting now will really define my stitches. 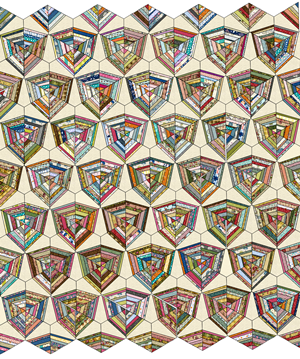 FREE Quilt: 'Heart It' is Launched ! Heart It is a charming heart themed quilt and I'm releasing it for free to all my group members. 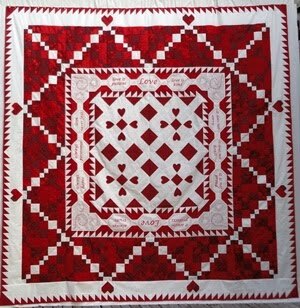 Do you have a heart themed quilt in your home? I don't - yet- so I decided to do something about that! Hearts are such a classic design and plenty of fun too. I've designed my hearts here in a 'sophisticated theme' of red and beige but I'm also falling in love with a girly scheme of pink and lemon. This is a quilt top design that can be made in a single weekend and completely satisfies my craving for simple pleasures - love hearts and simple pieced blocks. A perfect opportunity to show off those stash fabrics. I make a lot of intense quilts, so its nice to get back to basics. 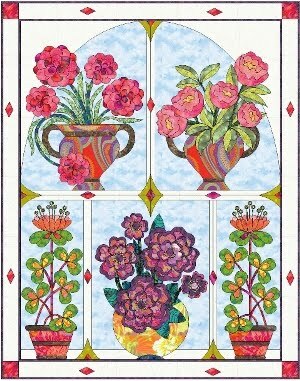 This pattern is ideal for beginners; full of repetition and practice with a good balance of piecing and applique. What's not to love about that? 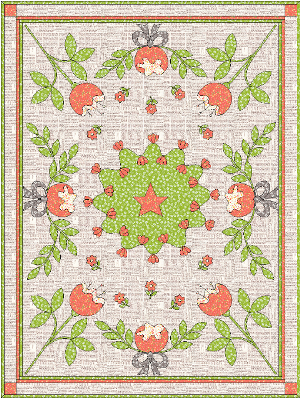 The full complete pattern is available in my Yahoo Group for free. It will be available there for 1 month. 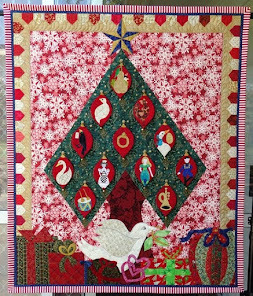 If you make this quilt, please consider letting me know by adding a comment to the Heart It page at the top of this blog. There's also a linky there for any bloggers that want to share their journey with the rest of us. Today is an unusual WOW in that I'm not doing any sewing. I'm instead sorting through some boxes in the garage as we are having a garage sale. I think I have been downsizing for the last 5 years, it's just so hard. But other than that, its just so time consuming. But even so, some decisions are easier than others. Take for example my bag of sewing kits. I don't know why I even have so many. I guess its a bit like having hundreds of matchboxes back when everyone handed out little matchboxes wherever you went. That doesn't happen nowadays, but I can remember when it did. 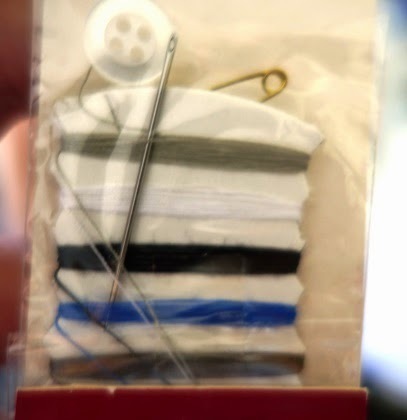 I think my sewing kit collection grew in the same way. 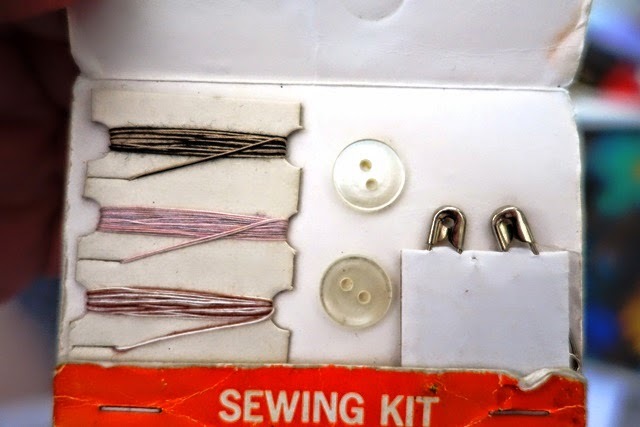 This is a basic sewing kit, it's rather pointless as it doesn't actually include a needle. the rest are all exactly the same, except for their different cardboard covers. 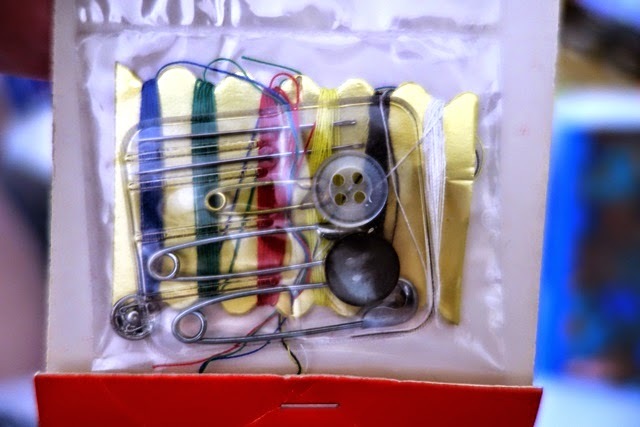 I really wonder if anyone ever uses sewing kits. Did they ever? I know having hundreds of these in a bag is completely pointless and yet I think they're rather cute and don't really want to part with them. But I will.I definitely will. 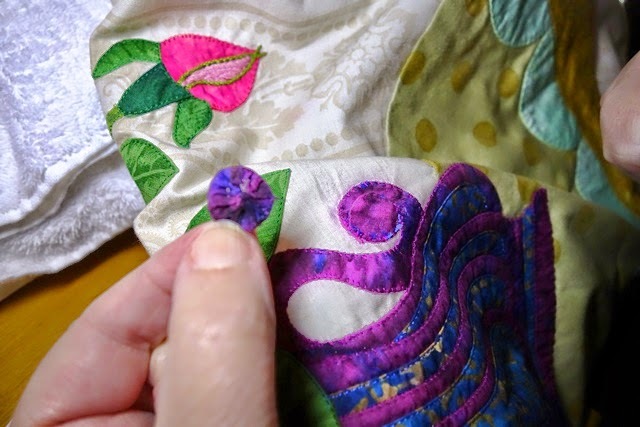 In Oma's Blues, you have the option of creating charm plates with a ring within them (you could of course simply stitch down a fabric that you love, without applique, depending on the look you're after). 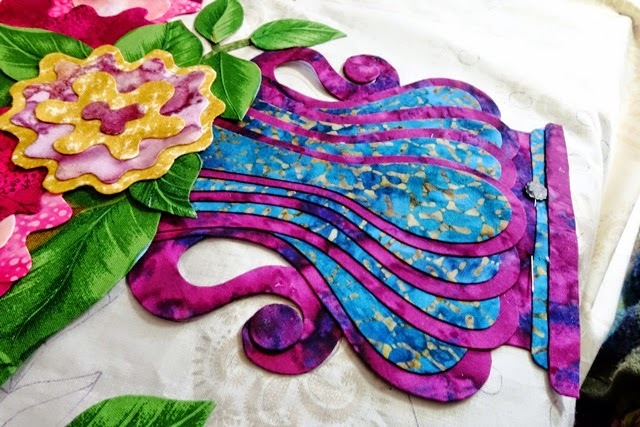 With the charm plates themselves, this inner ring is quickly and easily appliqued with fusible. Oma's Blues Part 2 is Launched ! Phew, I'm launching on time! Yes, my copier issues are finally behind me and hopefully my trusty old Toshiba will be able to keep up as I intend 2015 to be my year for BOMs. Since last month, some of you have already started on your centre plates - and they're all looking wonderful, just how I imagined them. I'm feeling really sorry at the moment that I'm not making the pattern with you at the same time. This is how it has to be for most of my patterns from now on. There just aren't enough hours in the day for me to make everything I design. 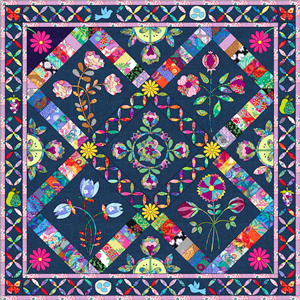 Mind you, if I didn't have so much going on this year, I think I would 'pause' LE for a year to get Oma's Blues made because I'm completely in love with it! 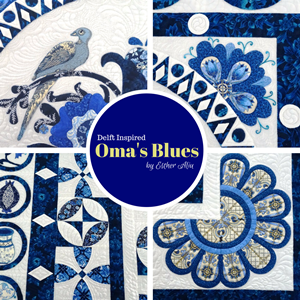 You've probably noticed that I've started an Oma's Blues board over on Pinterest (you can see it from my Oma's Blues Page at the top of this blog). If you're making this quilt, be sure to share your journey with us. I've already seen some fabulous fabrics as well as one member who is going with an oriental inspired version...I can't wait. My heart skips a beat when I see a new image uploaded. 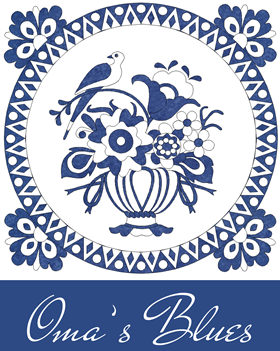 I never knew so many of you were in love with the idea of a blue and white quilt too, and I'm so happy that Oma's Blues has snuggled into your hearts . 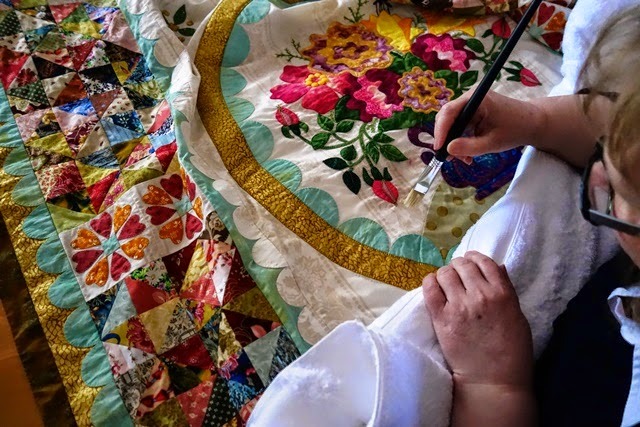 I know many of you also remember your own Oma's with dishware and I've been touched by the emails I've received by those of you making your own quilt in memory of a loved one. What better use for a quilt can there be? 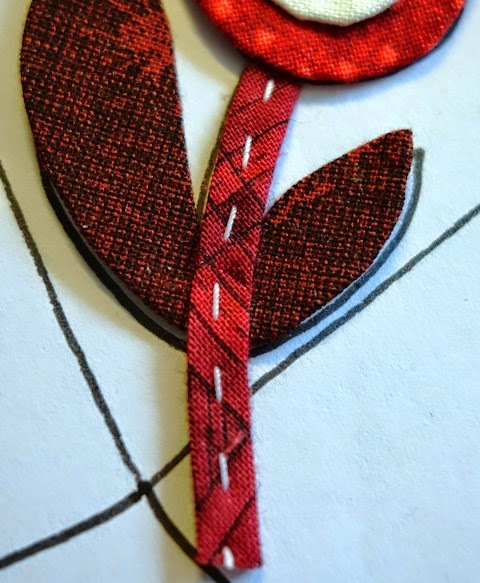 This month you will be creating the 4 x roses charm blocks and I already know they're going to be beautiful. Oma's Blues is a free BOM available to members of my Yahoo BOM Group. Today I'm sewing in the borders and I hope to be done by lunchtime. 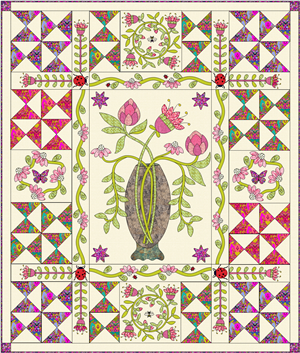 I'm thinking about puffing out the oval frame by stuffing it lightly, just like I did over some of the flower details. I'll take a look at it when its all together and decide then what should be done. I'm feeling so determined to get Lily Rose completed as I know that its now or never. Meaning that if I don't finish this WIP now, when will I? I have so many WIPs I'm too daunted to even answer that question! 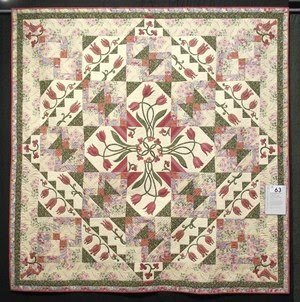 Often as I work I listen to the Quilt Show that I'll have running in the background or the radio. Today I opted for the radio and I've already had to change stations twice. There's a lot of nonsense on the radio about it being Friday the 13th. Well, I don't believe in bad luck or that a number can have any power over your luck, but if it did, surely talking about it non stop wouldn't help?? What about you? will you stay home today? Or avoid threading a needle? Or do you have any other sewing superstitions you pay heed to? I'm working on those corner bits that are in each of the four corners of the centre. For LE, I resorted to calling certain shapes dewbies because I had no words for certian shapes. I don't know what to call these shapes, other than centre background bits or CBBs. They're lovely and I want them, I just don't know what to call them. Anyway, I've made one and I have the other three prepped and ready to be made. 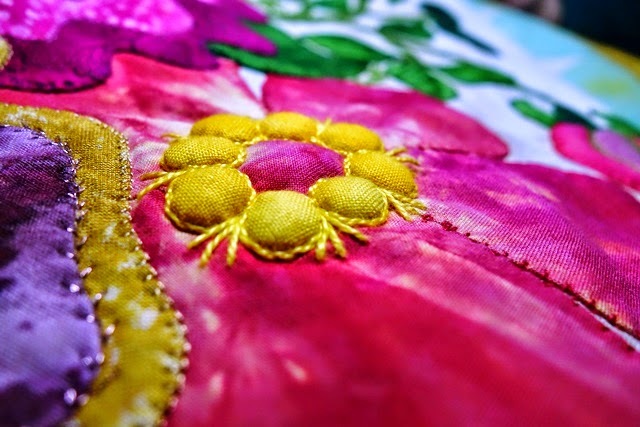 I've decided to dedicate another day to embellishing the bouquet with simple stitchery. 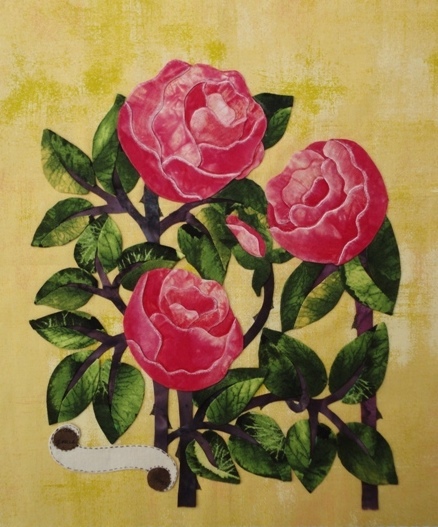 In this case, I'm focusing in on the rosebuds to give them some dimension as I felt they were a bit flat. 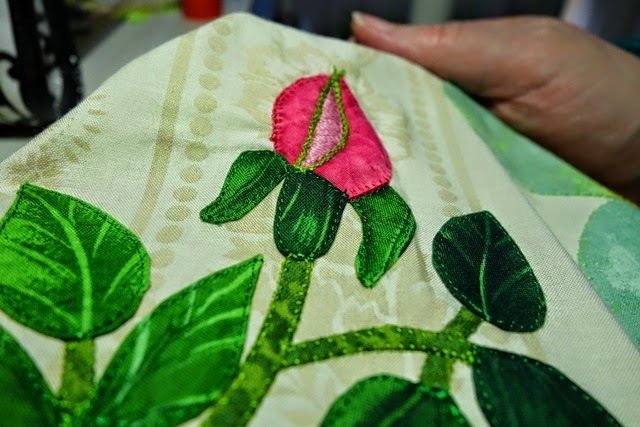 It's a bit wrinkly, so I'm going to make a tiny snip behind the fabric and lightly stuff a tiny amount of batting behind the rose applique fabric to puff it out. 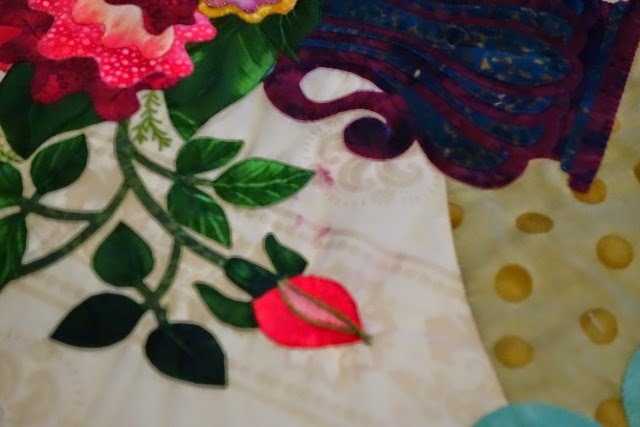 At this stage I should mention that I have already sewn down my bouquet to the background fabric. It is in position. I have lightly stuffed my pink flower centre in the same way, I think that little bit of dimension makes a real difference. 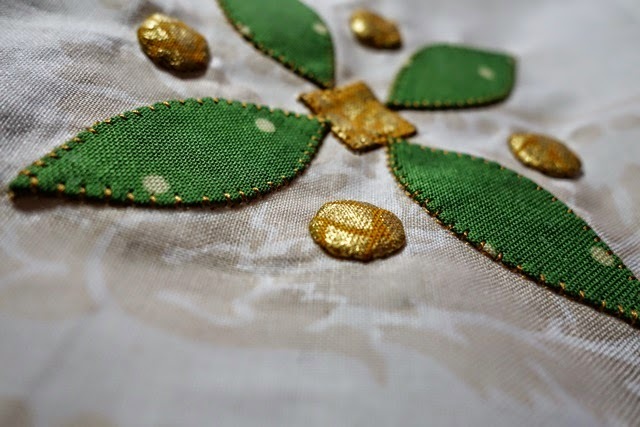 I don't usually sew or blog on Saturdays - its strictly family and off screen time, but this weekend is an exception for me as I am home alone...so I thought I'd make the most of it and keep myself busy. I've had a really productive morning. After 45 minutes of tinkering on my disaster Bernina 820 machine, it randomly started sewing OK, so I decided to get stuck in. 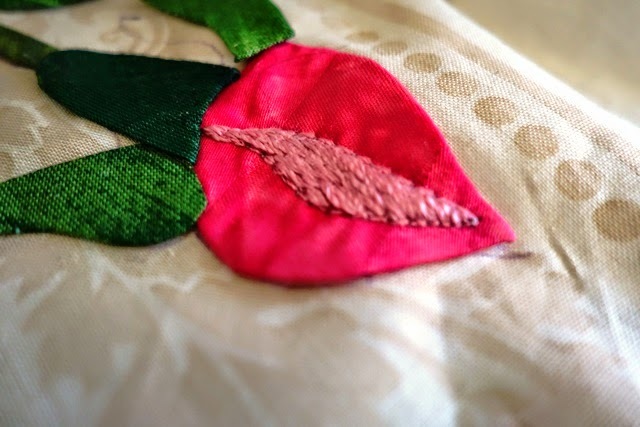 I've been in two minds about this since last week when I was deciding how to stitch down my applique. 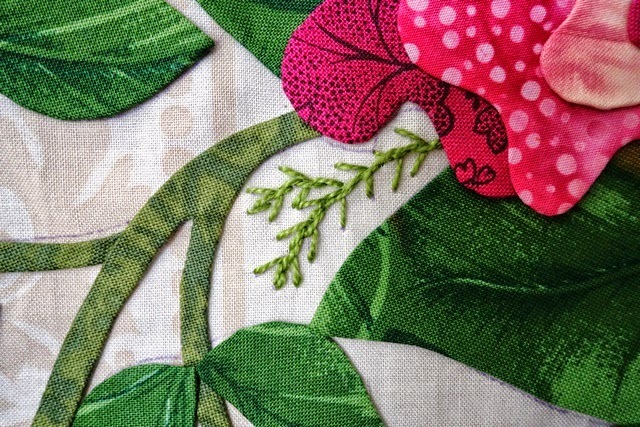 I have put a lot of time and work into Lily Rose and at every turn, my Bernina 820 has failed me. 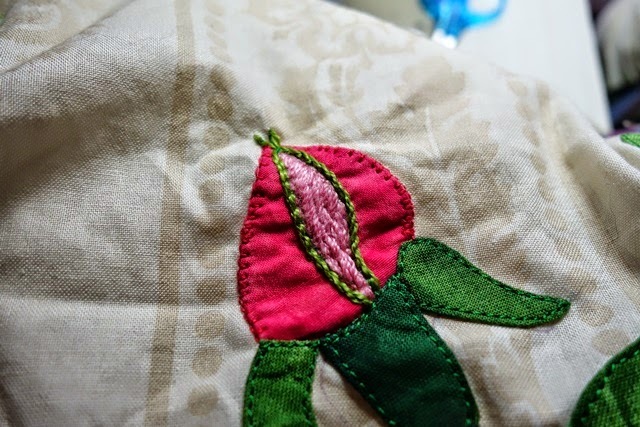 It reduces the quality of my work and I get so furious and upset when I see hours of work being damaged by poor stitching. So just sitting down on this machine is an emotional annoyance for me, I never know if I'm going to regret it, or if it will work just fine. Today it isn't behaving 'fine', but it is behaving OK, so I made a dash for it. So here I am later that same afternoon, blogging about it. 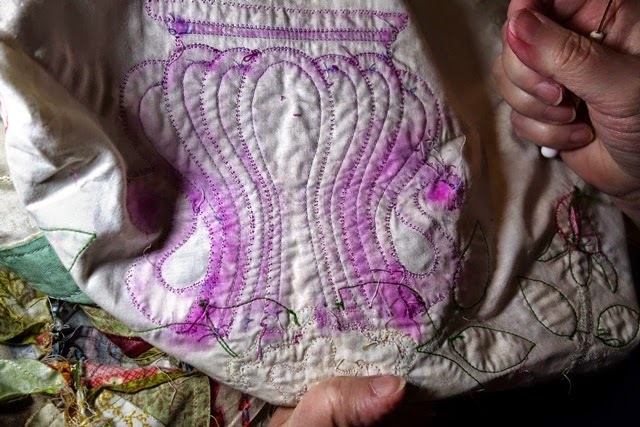 I can afford to do that now as light is fading and I can't sew any more today anyhow. 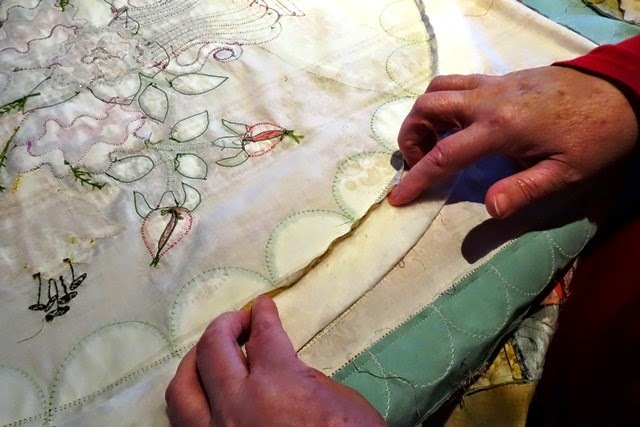 I will try again tomorrow and hope the the 820 pixies return and get the Bernina back into a good mood for me. They say a good workman never blames his tools. That's too convenient for badly manufactured machines. I say a good seamstress never has to wait for her tools to be good. 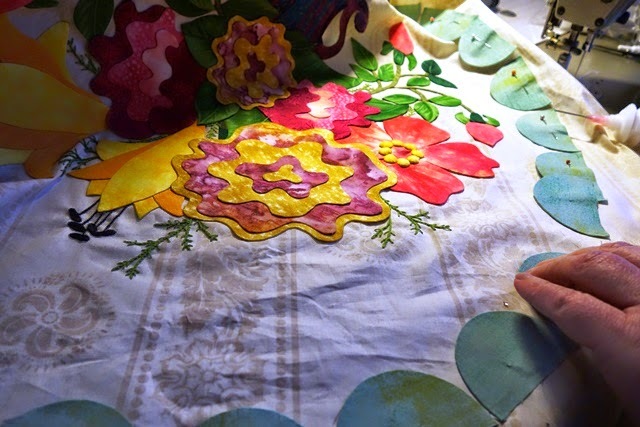 I have turn edge applique-ed all my flowers, but I haven't sewn them down into position on the background yet. 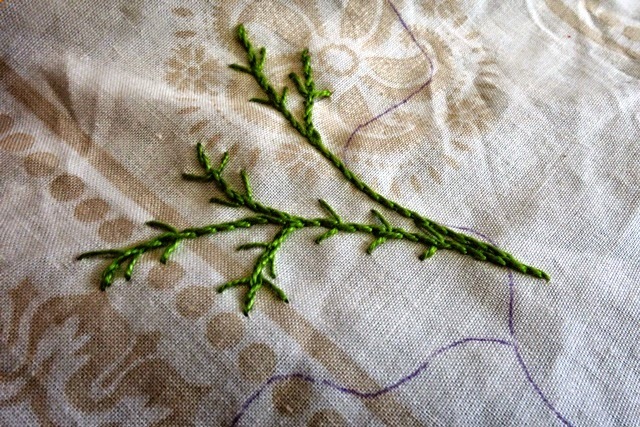 Before I do, I am hand sewing some simple, but I think highly effective, sprays of greenery between the flowers, like this. 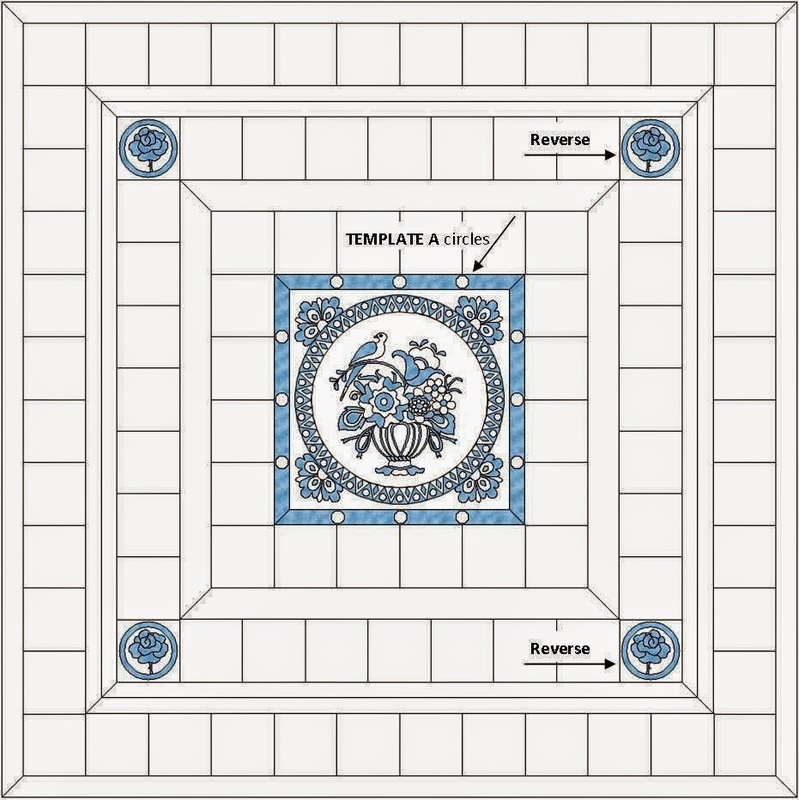 Using my pattern template outline as a guide for positioning. 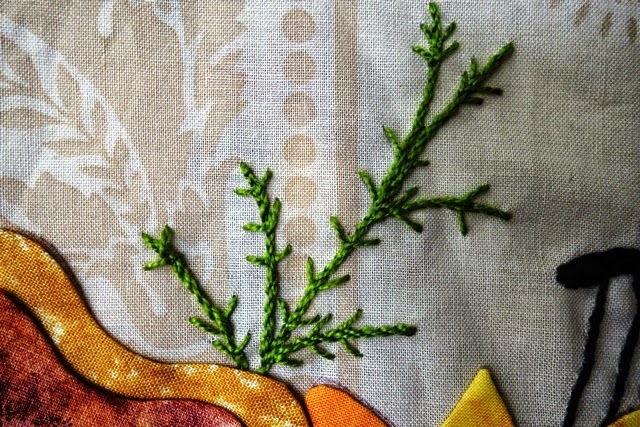 This is just the most simple straight stitching in an embroidery thickness thread. 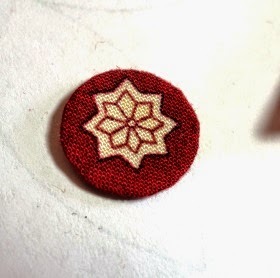 I'm using DMC thread here throughout from my stash. Such a little detail, such a big impact. 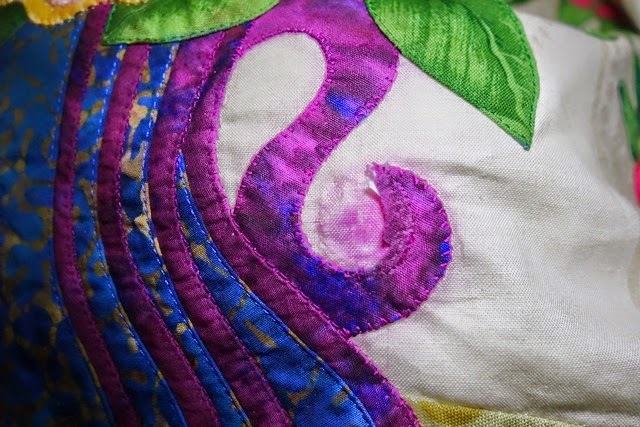 I don't mind having spent a day creating these details, I think they make the quilt all the more special. Sometimes I can stand back and say WOW about my own work. Not always, but sometimes. This is one of those times for me personally. This is how my bouquet had turned out. I love it. Naturally I'm biased, but I love the vase too. 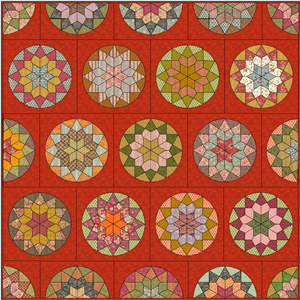 I'm so happy to have reached this stage, as I wasn't sure if I would have enough time to make this quilt. But I'm so glad I have. What do you think? Don't you agree that this vase just zings? It's all thanks to that original and tricky to match up original purple moody batik...it set the mood for everything else. I love Lily Rose and already know where I'm going to hang it up so that I can see it every day. Although I have a release schedule for my pattern designs, when I actually get around to making them is another matter entirely! So, I'm working through Lily Rose now although it has already been 'out there' for a while. For those of you who missed Lily Rose when it was a free BOM, it's available in my shop at 50% off at the moment. 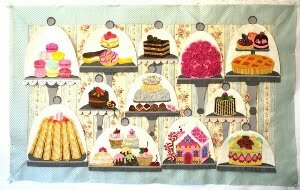 I never usually have sales or discounts for my patterns - but at the moment I'm celebrating 5000 members over in my online shop which is why my patterns are on sale now. 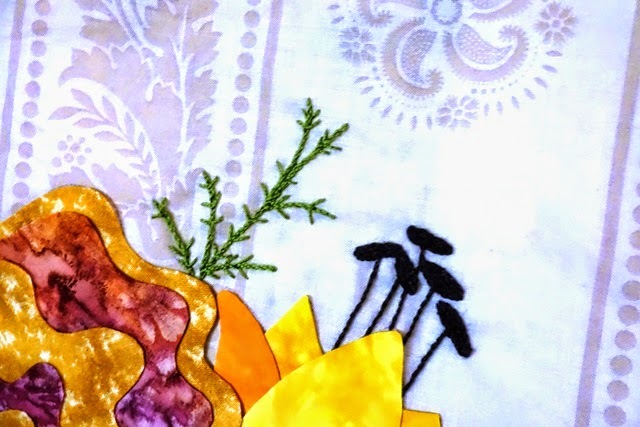 It's such a milestone that I wanted everyone to have the opportunity to 'catch up' on old patterns - especially new members, at the best possible price. Given that the next sale will be at 10,000 members (and it took 6 year years for us to reach 5,000) I don't think there'll be another sale in a long time! 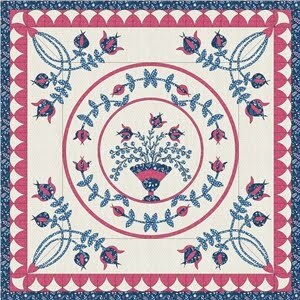 I'm grateful to each of you who purchase my patterns, it's so nice to know that I have your support. Thank you. 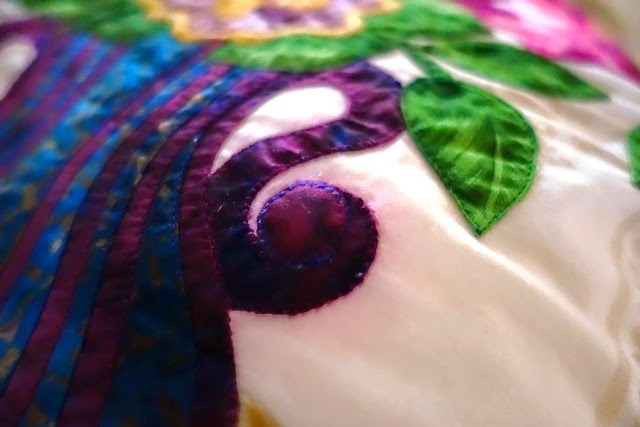 Now for me, it's more Lily Rose progress today and hopefully I'll be able to have this beauty done and quilted in the next few days. Are you coming to my AQC LE2 Workshop? April is fast approaching and I'm getting excited about teaching this gorgeous class all over again (the first excitement was a few months ago when I designed it for the first time. Since then, it's been on the back burner...but not for much longer!). Students who are enrolled in this class, please head over to the AQC 2015 dedicated page over on my website. You can do that now, by clicking here. It outlines what you need to do before the workshop so that you're class ready. Basically you need to decide whether you want to work on a whole cloth background (that is, the background being in 1 50 x 50 inch square piece) or on a divided background (the background divided into 4 pieces). 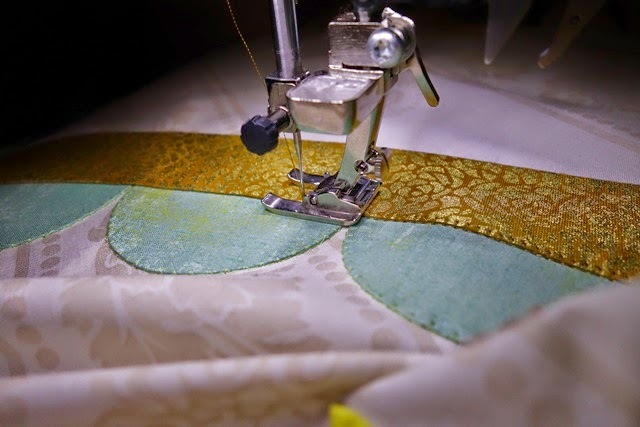 Once you've decided on that, then all you have to do is select your applique fabrics. If you're anything like me, that's easier said than done. 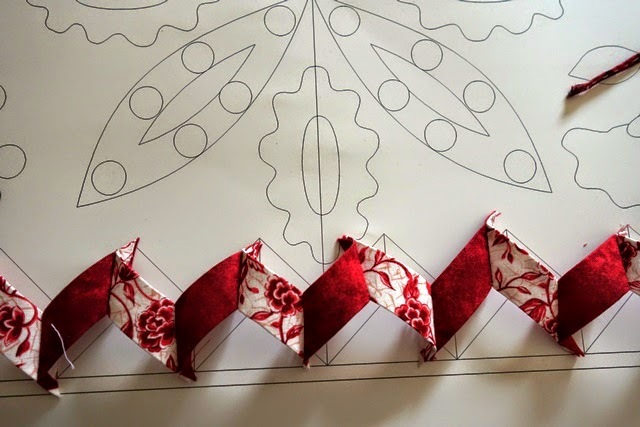 As you can see from the snippets here, for my LE2 wall hanging, I've opted for a red and white theme. This is a colour scheme I never tire of. 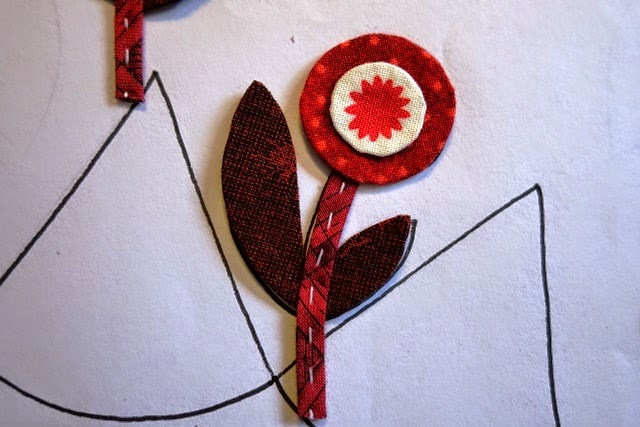 I was planning on making a second Love Entwined in red and white but have realized that I won't be able to, time wise. I just don't have enough quilting years in me to get all my work done. So I've settled for making one Love Entwined and 1 LE2. It's a good compromise for me. And it means I still get to indulge my love for all things red. 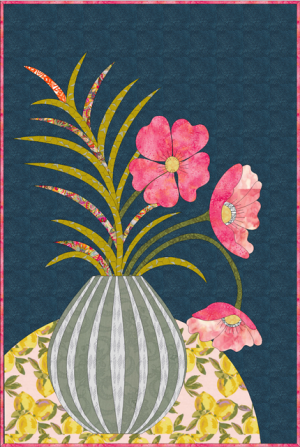 For my zig zag border, I've gone with a light and dark combination, repeated. I think its very effective. 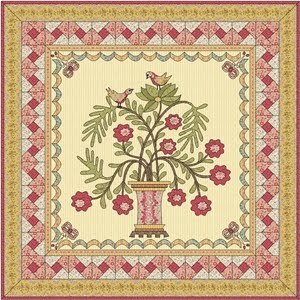 And for my applique fabrics generally, I've selected reds and red prints in hues of light, medium and dark to create depth in my pieces. I've also dug out all my interesting scraps. 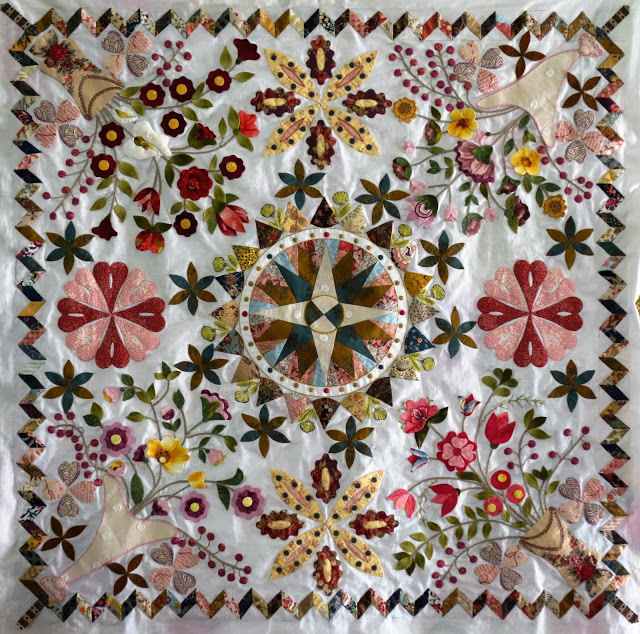 LE2 is just calling out for fussy cutting and broderie perse, so if you have a fabric you love or really want to use, this is a great quilt to showcase your eye for detail. 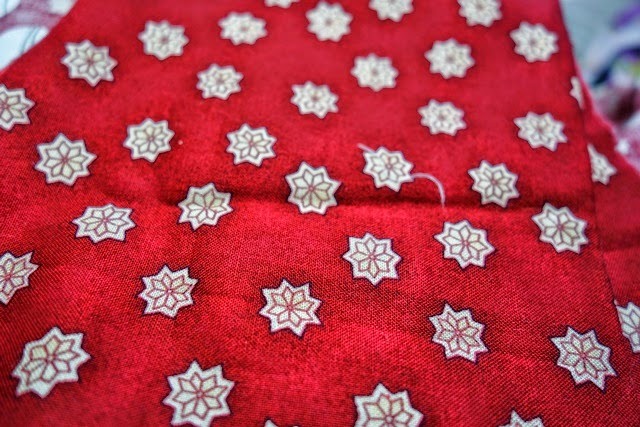 Isn't this a charming fabric? and I'm having so much fun with those little details too. See this white stitch line? I hand stitched that in after turn edging the stem. Don't you think this little dash of white makes all the difference? It just picks up the stem. I love it! 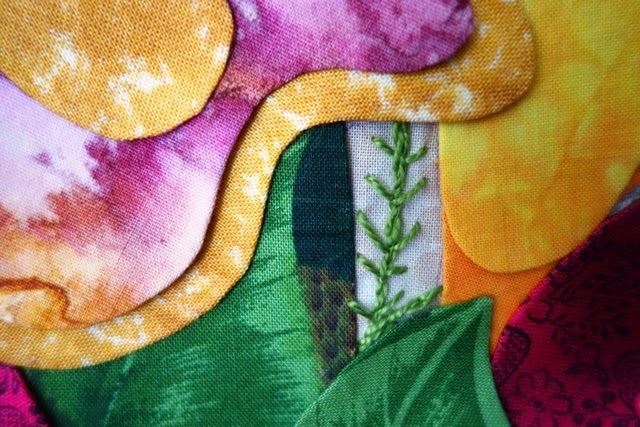 I'm so excited to be a part of AQC this year and to be sharing my love for applique in the LE2 workshop. For those of you who are in Melbourne in April, do head in and say hello. It's going to be a wonderful event and I'm really looking forward to meeting many new faces as well as familiar friends. Love Entwined 2 (LE2) is a workshop based on the original Love Entwined. 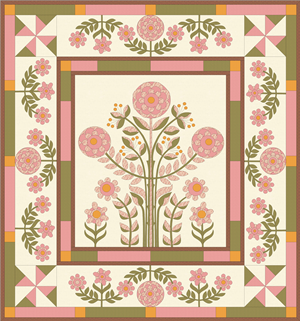 However, this version of the design is a larger focus of the centre applique block, as a wall hanging. It is an easier approach to Love Entwined with all the charm and enjoyment of the original. I'm delighted to be teaching it for the first time at AQC 2015. 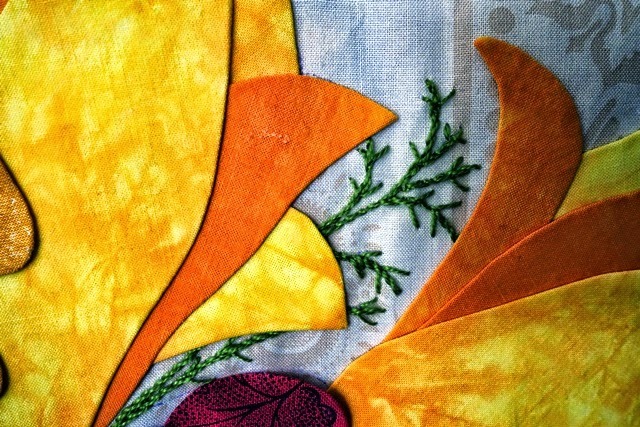 Hello, I'm Esther: a textile artist & quilter. 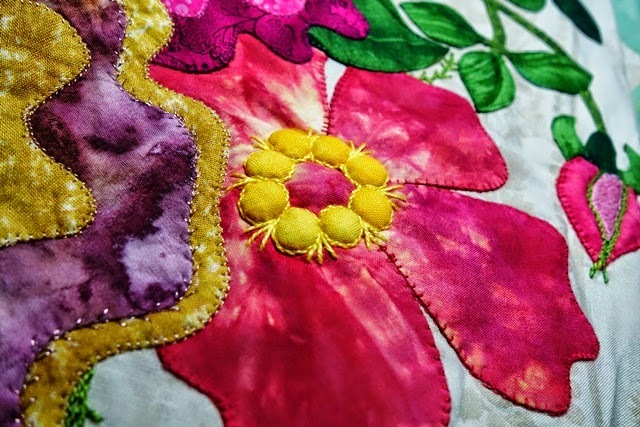 This blog is where I share my original Free BOMs, work on projects, talk quilts and experiment with new techniques. 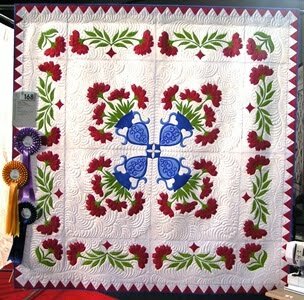 Find my Quilt Archives at the top of this page (and don't forget to add your own linky if you've made any of my quilts yourself) or leave a comment on the Quilt Archive Page and let us know what corner of the world you're in, it's always so nice to see how widespread our Group is! Each Wednesday you're invited to take part in my Weekly WOWs linky party as bloggers around the world drop in to share their stash busting efforts. 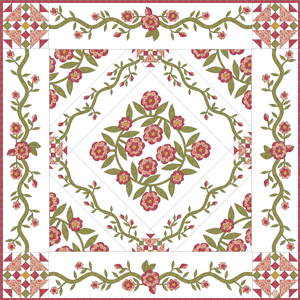 Visit my website where you can view my quilting galleries, BOM histories and workshop info. And don't forget to join my BOM Group where you can become a member and take part in my BOMs for free. 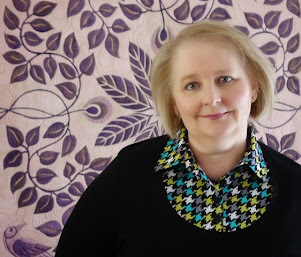 Join My Online Quilting Group! 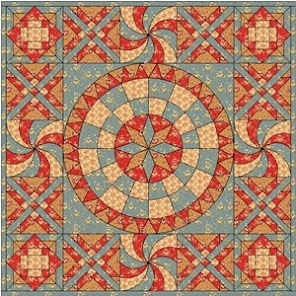 This is the place to download current free BOM patterns, chat with others and share your ideas, tips and pics as you make any of my quilts! 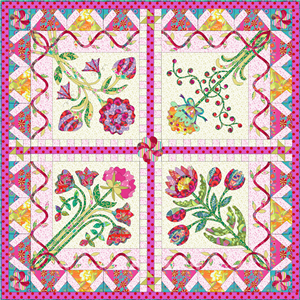 My Free BOM Quilt Group is located over on Facebook, click the image to apply to join. Membership is free & Moderated. Click this image to join. 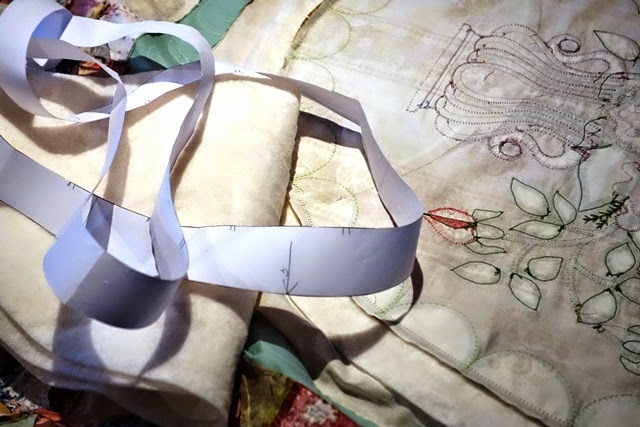 My Binding Tutorial - a Free Class! 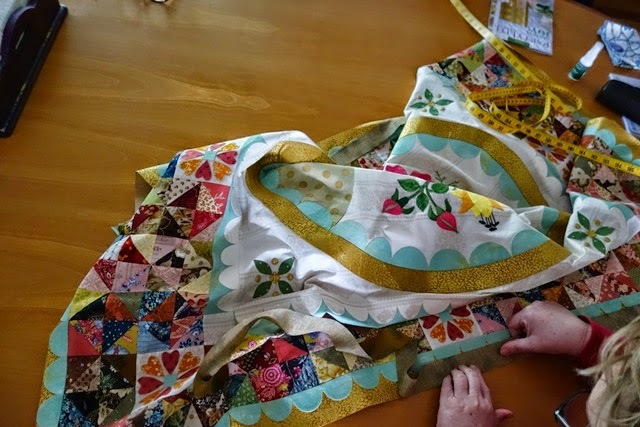 IF LIFE HANDS YOU SCRAPS, MAKE A QUILT! Hope Chest, a finish . . . . . .
All ready for hand quilting! 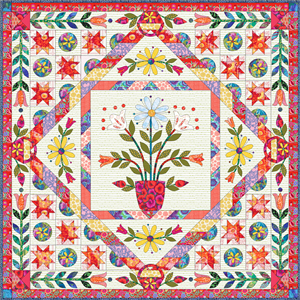 Diane Gaudynski "A New Tradition in Quilting"
New Web page and blog. 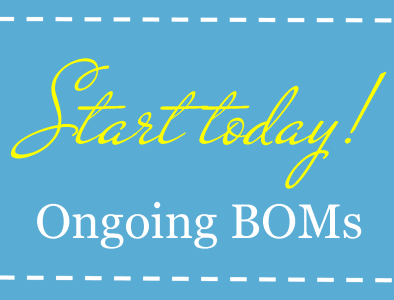 Start a New BOM Today! 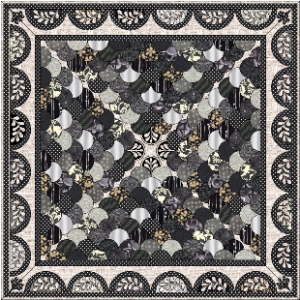 These quilts are perpetual BOMs - you can start any time, and receive your blocks via email each month. 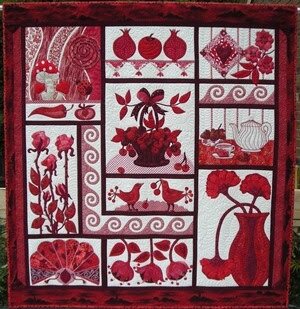 Applique lovers, my latest block of the month pattern is a real beauty that has to be seen to be believed! 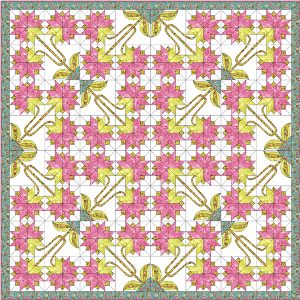 Click the image to view all the splendid details of this unique design and to browse all my blog posts connected to this quilt! 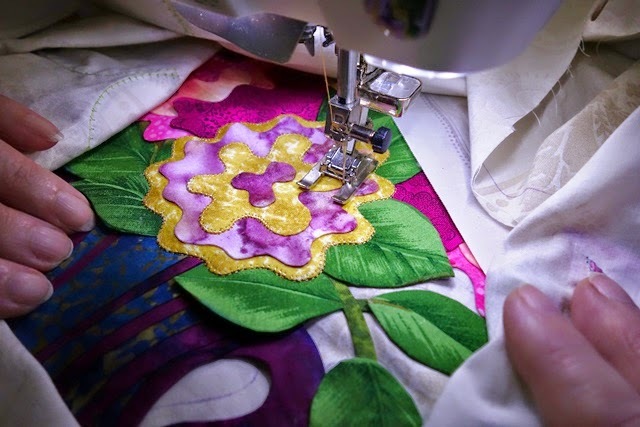 Love Applique? You Need This Book! 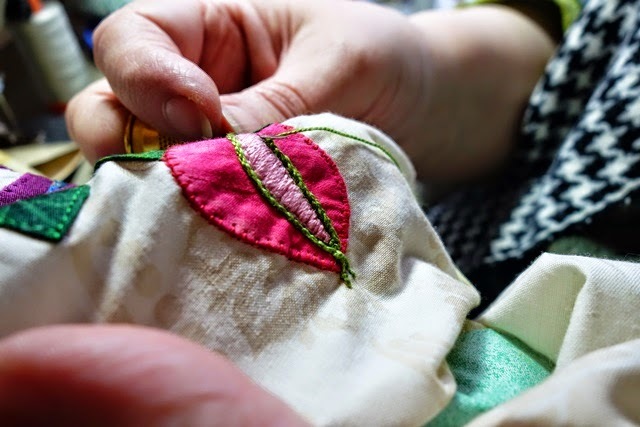 Here it is: this is the title I am always recommending to beginners as well as experienced lovers of applique. 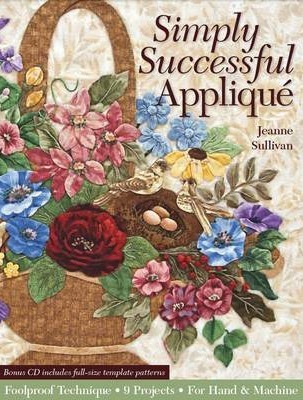 If you only buy 1 applique book, make it this one. Bright, bold and fun, perfect for beginners and groups! Celebrating 5 Years of Love Entwined! Where does the time go? 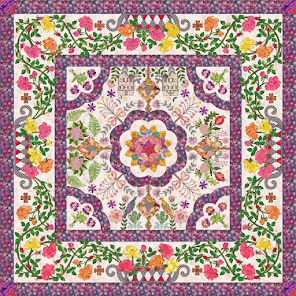 Can you believe that it's now 5 years since I launched this beautiful, mysterious, historic 'once in a lifetime' quilt pattern? Click here to follow along when making your own LE with step by step images, techniques and posts. 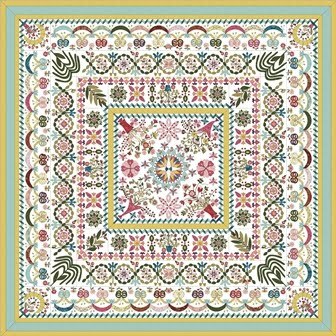 Follow Esther Aliu's board Love Entwined: 1790 Marriage Coverlet on Pinterest. Love Entwined - our own Group! 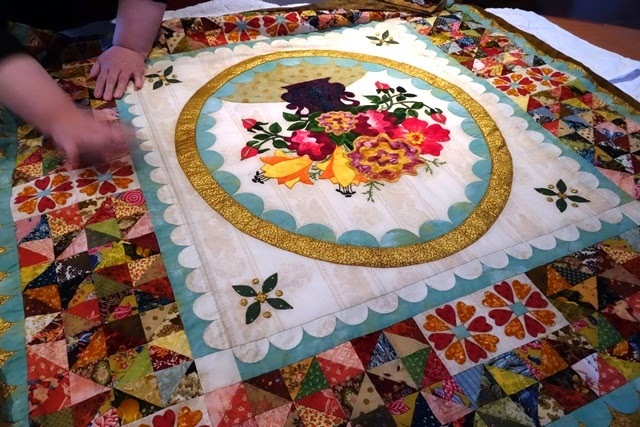 If you're making this quilt, be sure to join us in our specific Group for all Love Entwined quilts, projects and admirers. 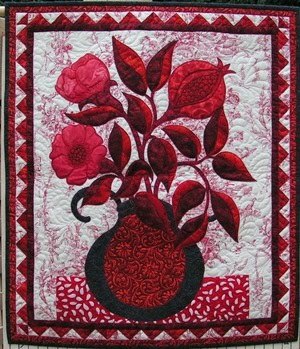 Looking for one of my quilts? 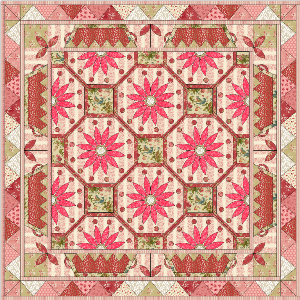 Folky, festive and full of classic red motifs, meet your next classically Christmas quilt! Perfectly festive and lots of fun!